It is an exciting week for startups, entrepreneurs, and small businesses in Vancouver with the initiation of the Vancouver Startup Week and all the events that are happening this September. As mentioned by Mayor Gregor at the opening gala of Vancouver Startup Week, “Vancouver is one of the world’s hottest innovation zones and a thriving startup scene”. Returning for the second year to Vancouver after its debut in 2014, the SociaLIGHT Conference is a 2-day event, with the mission to provide support for young Startups to transform into thriving and sustainable businesses. 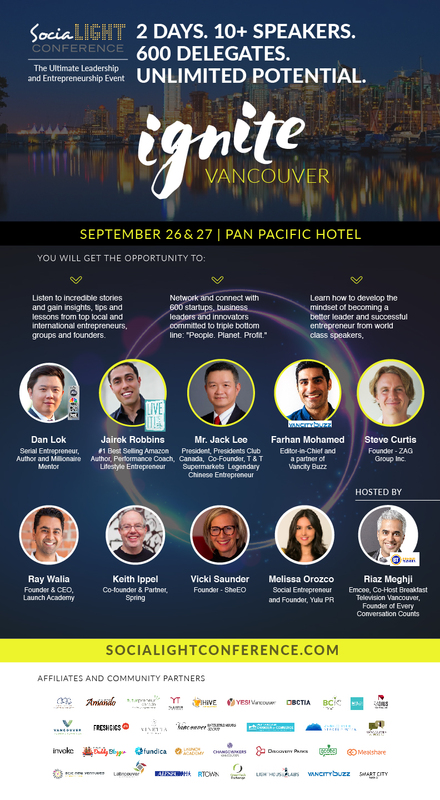 This event taking place on September 26th and 27th at Pan Pacific Hotel brings together top brands and influential industry leaders and has been called “A Mecca For Emerging Entrepreneurs” by You Inc. The SociaLIGHT conference provides a great opportunity for young entrepreneurs and businesses-minded people to listen to successful leaders sharing their stories and to network with over 600 businesses and influential entrepreneurs. Among the speakers, Steve Curtis will be sharing his journey as an entrepreneur and innovator who founded the Zag Group with a $500 credit card and turned it into a company making over 5 million in annual sales in less than 5 years. Also, hoping to inspire young entrepreneurs, Jack Lee, the co-founder of T&T supermarkets, will be telling his story of how he transformed into a legendary Chinese entrepreneur starting off as a salesperson making $800 a month selling meet after he immigrated to Canada. Theresa Laurico is the woman behind SociaLIGHT, who as a passionate entrepreneur and global leader, aims to empower small businesses, startups and entrepreneurs to grow with the emphasis on social consciousness. Recipient of many awards including the Leadership Award from former Lieutenant Governor Hilary Weston, Theresa believes entrepreneurs can change the world. We are thrilled to take part in this conference as we share SociaLIGHT’s belief that businesses can be used as a force of good. ← Vancouver Startup Week is Back!